On November 15 and 16, Tan Sri Dato Dzulkifly Abdul bin Razak, the newly appointed Rector of the International Islamic University of Malaysia hosted a conference on Values and Higher Education for 600 faculty and staff of the IIUM and invited guests. The conference represented the opportunity for Dato Dzul, as he is known to the wider community of friends, to provide a philosophical mission statement to the IIUM since his appointment by the Government of Malaysia in August of 2018. Dzul was the Rector of the University of Science Malaysia for 10 years before becoming the President of the International Association of Universities. He is among a select number of visionary higher education leaders in the world who has a capacity for articulating big ideas and for finding ways to transform ideas into the life of universities where he has worked. He has been a leader in higher education and sustainable development within UN circles and beyond. He supports concepts of knowledge democracy and knowledge for change and the role of Indigenous knowledge in decolonising higher education. It would appear that among his mandates from the Ministry of Education is the challenge of revitalize the IIUM, to bringing it fully into the 21st century, deepening its values base within an Indonesian philosophical framework and in general deepening the values based transformative nature of its research, teaching and learning, and community engagement. The Conference was begun with a speech from the young Minister of Education and then the Director-General of Education. Their contributions were presented of course in Bahasa Malaysian. 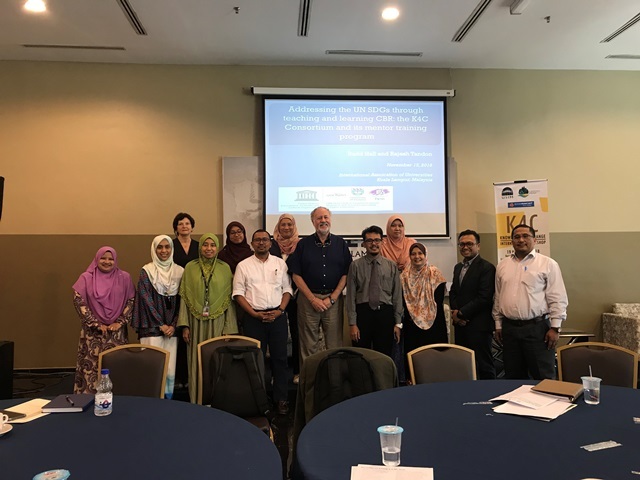 The following morning the conference heard from three international visitors several IIUM scholars, and a dynamic political sociologist from Universityu Sains Malaysia. The international contributors included Budd Hall, UNESCO Chair in CBR and Social Responsibility in higher education, Hilligje van Landt, Secretary General of the International Association of Universities and Betsan Martin, an social justice and sustainable development activist-scholar from Aeteroa New Zealand. Budd spoke on ‘decolonisation and knowledge democracy’, Hilligje on ‘University Autonomy” and Betsan on ‘ResponAbility’, a concept of relational justice with humans, other life forms and the land. Dzul wrapped up the morning session with his vision of how IIUM could realize its ambition to become a dynamic leader of values based higher education. Central to his presentation was the concept of Falsafah Pendidikan Kebargsaan (FPK), a educational philosophy first articulated some 30 years ago and in need, according the Dzul, of some tweaking and up-dating. The core of FPK are the balance and harmony of the intellectual, the emotional, the spiritual and the physical. To this he added the concept of Sejahtera. Sejahtera is an Indigenous Malay concept that is difficult to translate into English, but refers to qualities of abundance, happiness, prosperity, peace and tranquility. It underscores that indigenous knowledge and wisdom have their own uniqueness, strength and relevance in the face of contemporary crisises. Dzul presented the 600 participants with a vision of a university where concepts off FPK, Sejahtera, sustainable development, the UNESCO 4 pillars of learning, Knowledge 4 Change and responsAbility were all part of an organic balance, a quintuple helix where spirituality and values lie at the centre. He stressed the goal of decolonising the curriculum, become free of ‘ranking’ mania and broadening the criteria for career advancement to include community engagement and CBR. His ability to combine the UN SDGs, the concepts of Sejahtera and FPK along with knowledge democracy and other aspects of thought into a coherent values statement meant to guide the IIUM over the coming years was masterful. It will be fascinating to see how much change can be possible at IIUM.